Learn more about the many types of prenatal infections and how to help prevent them! Learn about Prenatal-onset Group B Strep Disease and earn CME credit, too! Visit the POGBSD symposium page! includes miscarriages and stillbirths caused by group B strep. Currently, babies who are born already infected with group B strep are classified as "early-onset" regardless of when the infection began. However, early-onset prevention strategies don't prevent GBS infections beginning before a woman's labor starts or her water breaks. Currently there are no governmental health agency recommendations for the prevention of POGBS disease. However, following are several knowledge-based strategies which may help prevent unborn babies becoming infected by group B strep or other harmful microorganisms. In the 201o CDC MMWR, on pg 7, the CDC discusses GBS and it's ability to cross intact amniotic membranes. 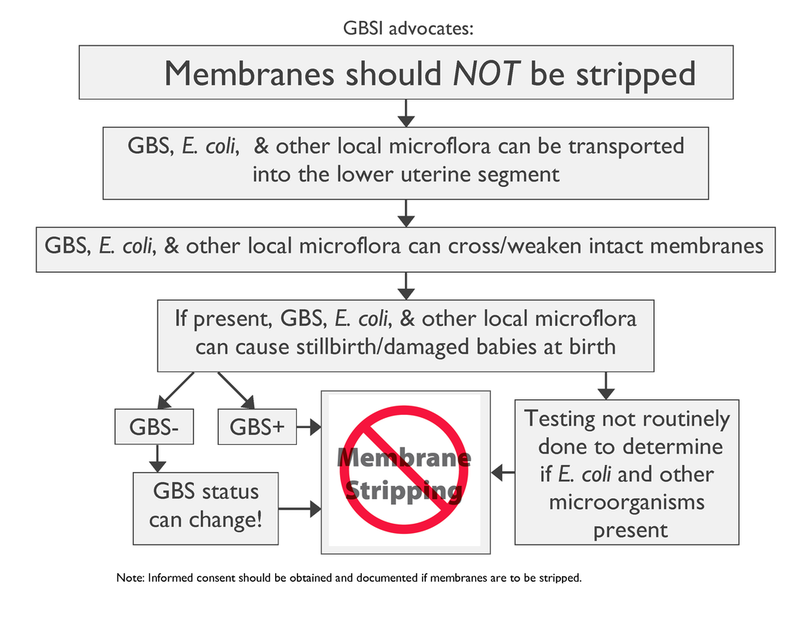 GBSI’s advocacy poster “Membranes should NOT be stripped” below (en español) explains why membranes should NOT be stripped even if a woman tests negative for GBS! It is important to know that E. coli and other local microflora can also cross/weaken intact membranes.